Fordham University was founded as St. John’s College in 1841 as a Jesuit institution. The school’s main campus at Rose Hill is located in the Bronx, the northernmost borough of New York City. Although the school was renamed in 1907, it has maintained its Catholic heritage. 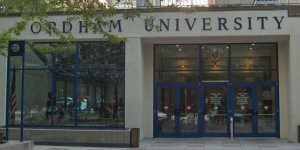 The Fordham Gabelli School of Business was founded in 1969 and offers AACSB accredited full-time, part-time and EMBA degree programs. The school’s Lincoln Center campus in Manhattan was established in 1961, and the Westchester campus was established in 1976. The Fordham Gabelli School of Business is located on Fordham’s Lincoln Center campus, near the Lincoln Center for the Performing Arts in Manhattan. The school also hosts MBA and EMBA courses at its Westchester campus, located in Tarrytown, a drive or train ride north of the city. The main campus is located just over 10 miles away from New York City’s LaGuardia Airport. Fordham Gabelli School of Business is housed in the Leon Lowenstein Center, which also houses the Fordham College of Liberal Studies, the Graduate School of Education and the Graduate School of Social Service. The building features classrooms, student lounges, administrative and departmental offices and the Lowenstein Café. The school’s Quinn Library is located nearby. There are currently 1,813 grad students at the Gabelli School of Business. Each class features an estimated 26 students, with a student/faculty ratio of 15:1. The Gabelli School of Business shares 123 full-time and around 100 adjunct professors with Fordham’s undergraduate Gabelli School of Business. Many of the adjunct professors are executives at firms based in New York City. Full-time, Professional, and Executive study are the three MBA options available at Fordham.